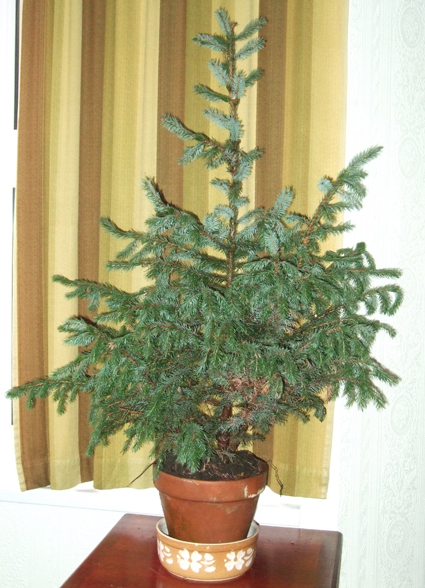 The little fir tree I bought last Yule has really grown. I bought a small, real Christmas tree in a pot in early December a year ago and put it up in my witchy room. 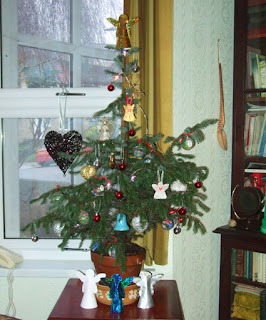 On twelfth night, I took all the decorations down and put the tree out in the garden, still in its pot. I tended it all year - and I have to say it did need quite a bit of tending. I watered it regularly. With the very hot summer that we had, it was constantly drooping unless I gave it a lot of water pretty much every day. The pot also frequently got blown over in high winds, so keeping an eye on it was also necessary to make sure it was mostly upright. Some time during the year I realised it had grown too big for its original pot, so I transferred it to a slightly larger terracotta one. Yesterday, I brought it back indoors and decorated it for this festive season. On this page you can see photos of what it looked like before and after adornment. As well as using baubles I've had for years, I decorated it with angels I made for the workshop I ran last weekend, on making magical Yule tree dolls. You can see one on the top and three around the base. There are also two hanging angel dolls on the tree that I made myself. Over the next few days I'll be sharing the details of how to make them as well as a guided visualisation I wrote to infuse your tree with the magic of the season. You can read more about seasonal dolls in my book Pagan Portals - Poppets and Magical Dolls, which was published this autumn. You can also view Poppets and Magical Dolls on Amazon.